The three night shows will be inside The Fire and will be $10, 21+, 9pm. The two day shows are on the outdoor stage and are FREE, All Ages, 2pm. The rainy weather is expected to be out of the Philly area by this weekend and it is going to be clear and in the low 70's for the outdoor stages, perfect! During the outdoor shows you can also enjoy various craft, art, and food vendors along with the music. 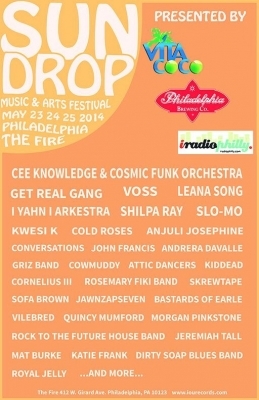 iradiophilly will also be giving a way a pair of 4-day passes to Firefly Music Festival in Dover, DE. You can only win if you come to Sundrop this weekend and register! We'll also have other giveaways and tickets to other area shows.